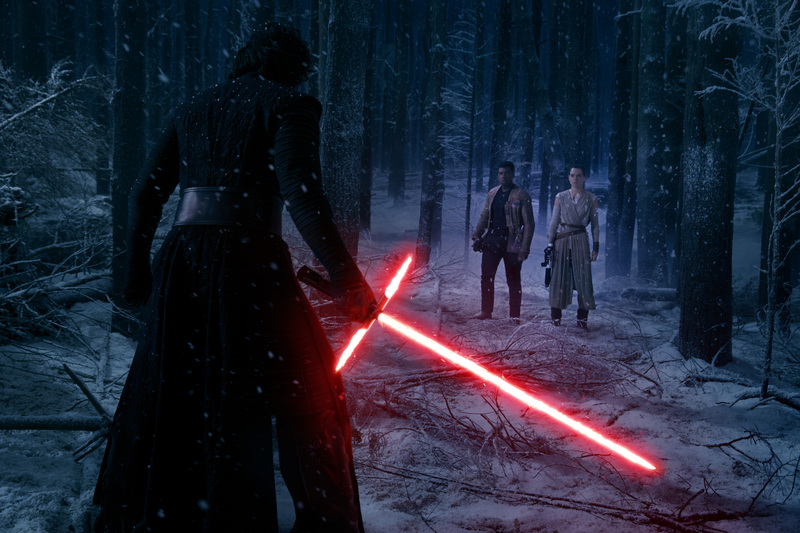 With a heavy heart, I write about Star Wars: The Force Awakens. If you’ve seen the movie, you know why, and if you haven’t, stop reading immediately and go see it. When I find myself grieving over a fictional character, I console myself with the truth that is expressed, and thankfully, a message of redemption comes forth in The Force Awakens. In a previous Star Wars post, The Meek Shall Inherit the… Galaxy?, I argue that we do not need to be violent or powerful, but through meekness and love, we can be victorious, not by defeating our enemies, but by calling them to change and become our allies. Rather than kill Darth Vader, Luke’s willingness to sacrifice himself for his father causes Vader to turn to the Light, resulting in Luke’s survival and the Emperor’s defeat. It worked! In The Force Awakens, Han Solo sees his son, Ben, who has turned to the Dark Side, now called Kylo Ren. He risks himself, offering Ren complete forgiveness and the opportunity for a fresh start as a family. In the saddest Star Wars scene to date, Kylo Ren kills Han Solo, his own father. Did Han make a mistake? He could have just left. Ren hadn’t seen him yet. What happened to meekness inheriting the galaxy? Star Wars: The Force Awakens argues that we should offer the opportunity for redemption, even if success is uncertain. We offer forgiveness and reconciliation for the sake of the other person, for ourselves, and for God. Why did Han offer a second chance? Because he loves his son. He wanted to see his son’s face again. More than his own survival, Han wanted his son to be free from the Dark Side, free from Supreme Leader Snoke who was manipulating him. So, did Han fail? We have yet to see. He may have died, but I believe he would count that as a worthy exchange for Ben’s redemption. And there are two more movies to go. Personally, I hope that Ben not only turns to the Light, but that the filmmakers make it clear that his father’s loving touch of his face, even after being attacked, will make the difference. The expressed love of the oppressed for the oppressor can have this effect Stephen, the first Christian martyr, speaks forgiveness to those stoning him, and it is possible that this affected Saul, a persecutor of the faith who later becomes a significant leader to Jesus’ disciples.1 There are countless testimonies throughout the last 2000 years of people deciding to follow Jesus after witnessing the persecuted forgive and love their persecutors. God offers redemption not only to the incredibly violent, but the subtly selfish as well. The transformed life is a gift from God. Would we prefer the selfish life of Han the smuggler or the noble life of Han the father, friend, and rebel against tyranny? And what of his death? The audience laughed after Harrison Ford’s response. Of course, we don’t want our lives or deaths to be accidents, but to make a difference. Han Solo had the privilege of being free from self-preservation, to live and die as the loving person that we all want to be. Sound great, but let’s face it: he died. “What good is a [changed life] if you ain’t around to use it?” The gift ended. Again, this does not sound like inheriting the galaxy. Before seeing the movie, I was actually emotionally preparing myself for Luke to die, which seemed likely as Obi-Wan dies in Episode 4 and Qui-Gon in Episode 1. It would not have been as sad because Luke would keep re-appearing as a ghost. Hence, what happens to us after we die might play a role in whether or not we should offer redemption. In the Star Wars universe, when a person dies, their essence becomes one with the Force and their individuality is lost. Only trained Jedi can keep their uniqueness intact.5 Consequently, Han is truly gone. If that feels jarring, unjust, or simply wrong, I think we can find some truth here. Sometimes we find truth in a story, and sometimes we find it in our emotional responses to them. The scene is so sad because the happy ending of Return of the Jedi, in which Han and Leia were together, was now lost. And where did the longing and belief in the happy ending come from? Scripture says that God “set eternity in the human heart.”6 After death and after Jesus’ return, the meek do inherit “a new heaven and a new earth.”7 Even if our offer of redemption is met with violence, we can trust a loving God to give us the happy ending of a joyous eternity with Him and each other. Lastly, we offer redemption for God’s sake. When Kylo Ren and Rey were dueling with lightsabers, I found myself hoping that Rey would escape, but not kill Kylo Ren. Why? I mean, I don’t like Kylo Ren. After watching the prequel trilogy and The Clone Wars, seeing Anakin’s love and loyalty to family, I genuinely cared for Anakin and wanted to see his redemption, but Ren is the whiny, insecure killer of Han Solo. He deserves death! Consequently, I want to see Kylo Ren turn to the Light Side for Han’s sake, because Han loves him and died for him. I do not want Han’s sacrifice to be in vain. Does Kylo Ren deserve redemption? For Han’s sake, I long for it. This is a reminder that people do not deserve forgiveness, a fresh start, or a transformed life. I don’t. Other’s don’t. So, we do not have to like a person to extend grace. Since Jesus sacrificed His life for everyone, I can hope and work for another’s redemption, so God would have His children back. In Star Wars, we learn truths in a cartoonish context when good and evil are blindingly obvious. So how can we relate this message to our lives? If a murderer of the multitudes can change when offered kindness, maybe the rude coworker will too? As we see from The Force Awakens, we learn that they might not, but I hope you are convinced that it’s worth the try. More so, let’s be honest in the areas that we need transformation. 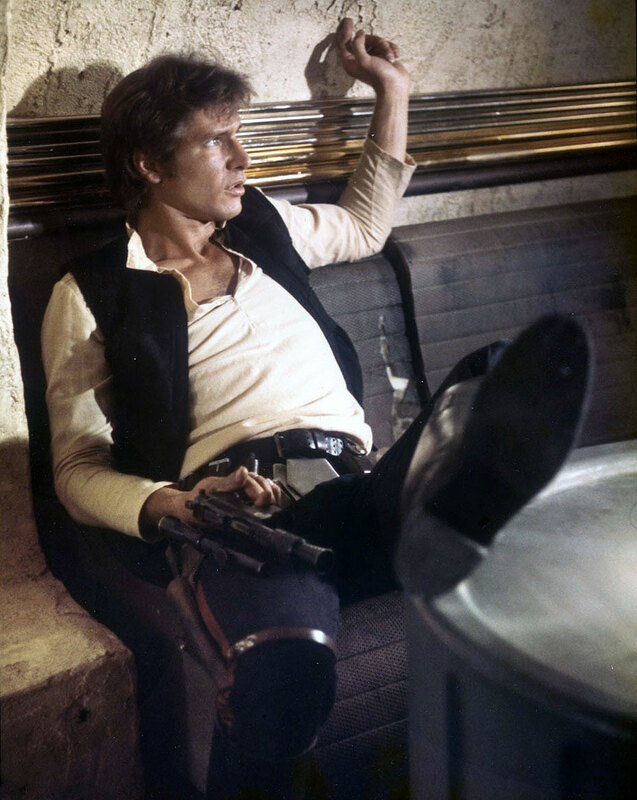 You or I might not be as bad as Darth Vader, but are you as amazing as Han Solo in his final scene? In either case, God offers you and I the gift of a life more selfless and more loving than the one we live now. All photos Copyright by Twentieth Century Fox and other respective production studios and distributors. Intended for editorial use only. You wish for redemption for a man who has killed not thousands but millions of innocent people? Is there then nothing that it unforgivable? Great question! Anyone can be forgiven no matter how much evil they have done. There is nothing that Ben could do to keep his father, Han Solo, from loving him and seeking his redemption. Likewise, there is nothing we can do to keep God from loving us and seeking our redemption. But this does not mean that any evil act can simply be ignored. It must be punished. While Han risked his life to offer forgiveness, Jesus knowingly sacrificed His life to satisfy the punishment deserved by our evil acts and attitudes. For more on the possibility of forgiveness, check out Can the Evil Queen Be Forgiven? I think I want to depart a bit from orthodoxy on this one, actually. I realize that the traditional answer to the question of how much God forgives is “infinite, his mercies never end!” On thinking about your comments, though, I think we can reframe the core question here in a more useful way. Forgiveness doesn’t happen in the abstract. Let’s say that, one day, I walk down the street and steal candy from a baby in a crib, and 15 minutes later gun down a church full of churchgoers. Even though we would say that one evil was more extreme or heinous than the other, it’s not as if I’m automatically forgiven of one offense but not the other. Each act of evil was committed against specific people, and if I were to receive forgiveness, I would need to receive forgiveness from each specific, individual person that I had wronged, assuming that he/she is willing to extend the forgiveness. So, if victims of my church shooting spree forgive me (like the survivors of the Charleston church shootings last year)*, then that evil is forgivable, even if the wrong is severe. And, if the baby refuses to forgive me for stealing her candy, then that evil is not forgivable, even if the wrong is slight. In other words, every wrong is forgivable to the extent that the wronged party is willing to forgive. If their capacity to forgive is greater than my ability to commit evil, then my evil is forgivable. So the good news is that God’s capacity to forgive is *vastly* beyond my (or anyone else’s) ability to do evil! However, the bad news is that God isn’t the only one I need forgiveness from. In my little hypothetical example, there’s still everyone else: the baby whose candy was stolen, the parents who are now freaked out about living in a place where a guy literally steals candy from their baby, the deceased victims of my church shooting, the survivors, friends and family of the victims, and anyone else intimidated or otherwise hurt by my act. There’s no guarantee that any of them will forgive me, and in the case of the deceased, they quite literally cannot. What a gift! This is literally the kind of power that overcomes sin and death itself. How can someone I’ve killed forgive me? They can’t, I’ve taken the blessing of being able to forgive away from them. This is why murder is an unforgivable sin. Kylo Ren cannot be redeemed because those he has slaughtered can never forgive him. Yes, I agree that this is a problem, but I would go further. Not only is murder, by definition, unforgivable by the victim (since they’re dead), but so is any wrong committed against anyone who dies before the forgiveness is given. This may go down to some grudge a parent or grandparent holds against me which they never forgave me for before passing on, and I’m sure we all have some version of this. 1. For those who believe in an afterlife, death is not the end. Along with the opportunity to have life once more is the opportunity to reconcile and extend forgiveness. Of course, this is assuming that your individuality in the afterlife maintains a degree of continuity with your current life now. If the afterlife is simply becoming “one with the Force”, then we’re pretty much all out of luck. 2. At least according to Christian traditions, when we commit an evil, we not only commit them against the immediately injured parties, but we also commit them against God as well, since the act of evil is also an act of treason and perfidy against God’s order. So long as God is living, God can always extend forgiveness to us, at least for the wrong we committed against him. Is this the same thing as the full forgiveness we might want from *all* the wronged parties? Well, no. But I think that it’s certainly a step up from receiving no forgiveness from any party whatsoever. 3. This is not so much a mitigation as a qualification on my thought process: I haven’t actually used the word “redeem” or “redemption” yet so far, since I’m not sure that “redemption” is simply the same thing as “forgiven” in the context of either Kyro Ren or real life. I’m actually leaning towards the direction that the two things are actually *not* the same in either case. I’d be curious to hear both your and Andrew’s takes on the degree to which “redemption” and “forgiven-ness” are similar or the same thing, since both of you seem to suggest that these ideas go hand-in-hand with each other. To clarify my usage of terms, I would describe forgiveness as not seeking punishment for someone who has committed an evil act against me, but loving them anyway. Redemption is when a person turns from evil and is transformed into a good, loving person. In a Biblical context, redemption also involves being forgiven (and transformed) by God. Using these definitions, I would say that Han could love Kylo Ren, seek his redemption, and forgive him for his actions against Han. 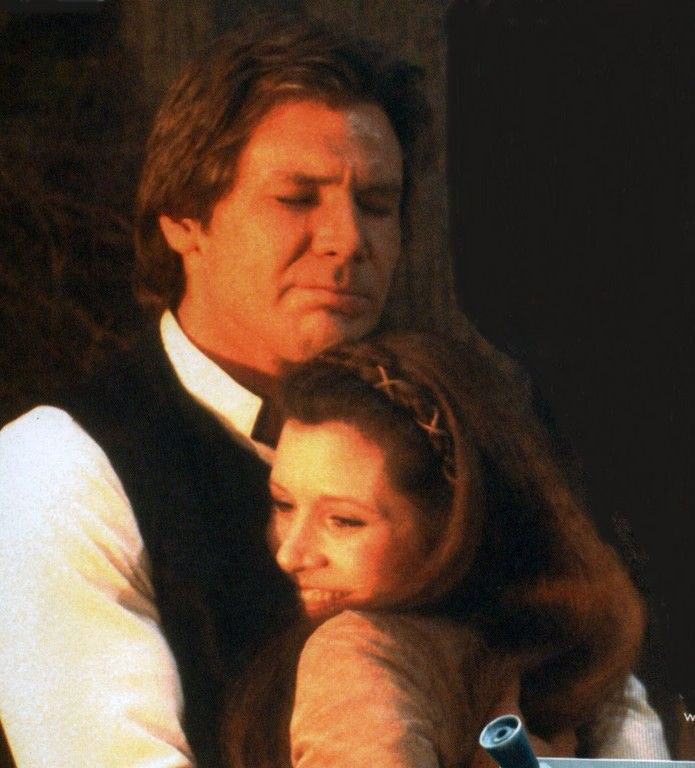 (Indeed, Han’s loving touch shows that he forgave his son of murder!) Han, however, does not have the authority to forgive (or acquit) Kylo Ren for killing others. Even if Kylo Ren turned to the Light Side, a strong argument could be made that he should still be subject to the New Republic’s justice system. Although a person may be punished by the state, God will always love us and offer the opportunity for redemption. Because He is the supreme judge, and because He has suffered the punishment for all our sins as Jesus Christ, He offers forgiveness and acquittal from divine justice as well. As we are not God nor the state, we cannot forgive a person for an evil act against someone else, but we can love them, seek their redemption, and forgive them for acts against us. Let’s be like Han! Obi Wan and Yoda thought that Anakin was beyond redemption, but Luke was able to turn him back to the light by his love for him. Since these new Star Wars movies have come out. Every time I re-watch “Return of the Jedi” now, I feel like “You all are celebrating now, but it’s all going to heck in a handbasket all over again in just one generation”. I agree completely regarding Obi-Wan, Yoda, and Luke. Good point! And I know the feeling about the end of “Return of the Jedi”. As mentioned above, God made us to long for the happy ending, which is why our stories frequently end with “Happily Ever After”. At the same time, we want more stories and many, myself included, want more Star Wars stories, so we trade our happy ending for more content. I’m hoping Lucasfilm ends Episode IX on a high point, one that makes up for Han’s (and the galaxy’s) loss in the preceding films. Previous Previous post: Can the Evil Queen be Forgiven?